of (value-rich) blamazing (rants &) chit-chat!! Inspiring, outspoken, ultra-educated, pioneering, rule-shattering, upbeat, unashamedly idiotic (from time to time) & often (inadvertently) hilarious. She aspires to create new & better ways in all things human... and loves to share whatever's on her mind! Check out YOUR Favourite Categories! Our new treat to tee-up your days! Short. Punchy. Resourcing. Uplifting. Refocusing. Idea-Generating. Thought-Provoking. Brain-Capacity-Expanding. Mind-Body-Axis Re-Tuning. De-stressing. Mind-Blowing. Unmissable! Just click this link & hit 'Subscribe'! The episode will then download to your Music/Podcast Library. GO TO OUR NEW SOUNDCLOUD CHANNEL & HIT 'FOLLOW' to hear DrAlex Daily from your playlist! & install it into your favorite feed reader. 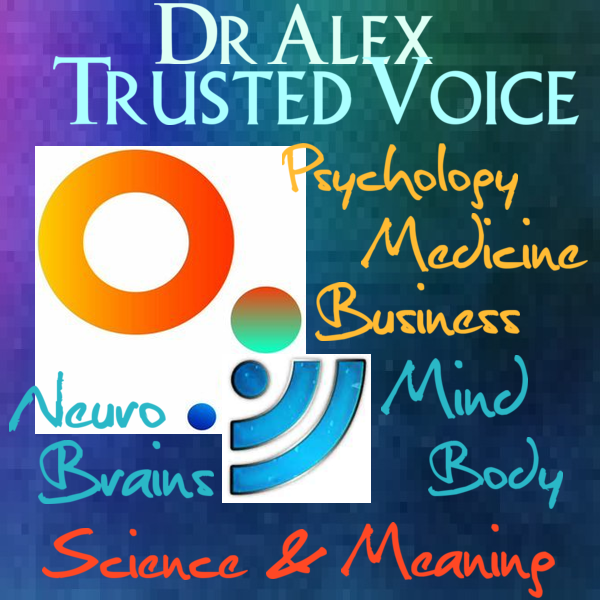 iTunes 5-Star-Rated Dr Alex's 'Trusted Voice' & 'Radio-Rescue' Podcasts here on 'Dr Alex Talks'.... across 20 fascinating categories! You can find these valuable 30 or 60 minute Radio Segments are in our blog section... It's work in progress, so get the RSS feed for updates! OR check out the blogtalkradio widget below. GO TO OUR BLOGTALKRADIO CHANNEL & hit 'Follow' - You'll get email reminders with a backlink, everytime a show goes out. NB DISCLAIMER: DR ALEX'S PODCASTS ARE NOT MEDICAL ADVICE, NOR PSYCHOLOGICAL ADVICE. They are Dr Alex Concorde's own opinions, or her critique of available science, for the purposes of education. If you have any specific problems visit your Family Doctor, or other Medical / Health Professional, or Psychologist / Psychological Professional for immediate help and treatment. By using our site you are agreeing to our Terms & Conditions.